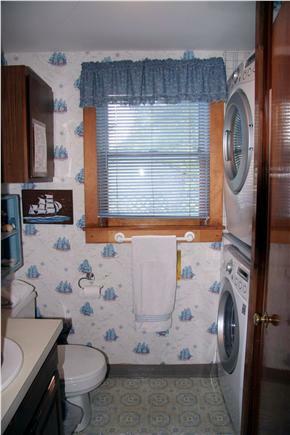 Full bath off kitchen with washer, dryer and shower. Screened in porch, perfect for an afternoon nap, to play a game. Very rare to find, in this area, large yard to play in! 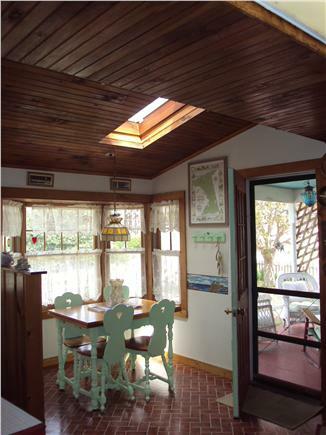 Just steps from the Beach, this charming beach house has all the quaint characteristics of a true Cape Cottage with Knotty Pine and cozy nooks along with all the conveniences of a large modern kitchen and updated bathrooms to make your vacation completly carefree and comfortable. Sleeps 10. Master bedroom w/private 1/2 bath is on the 1st floor. 3 large bedrooms and one full bath upstairs, 2nd full bath w/Washer&dryer right off the kitchen. 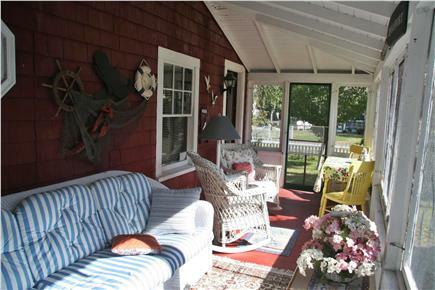 Have your morning coffee on the porch enjoying the sun rise, or in the sunny breakfast nook. After a day at the beach shower in the outside shower w/ Hot and Cold + dressing area. Gas grill and picnic table. If it rains you can catch the game on th 32'' TV or watch a movie on the DVD. Free WiFi. Close to miniature golf, go carts, movies, walking distance to many resturants and shops in the quaint village of Dennisport. This is a Great home for two families to vacation. Plenty of room inside and out for the kids to play. Lg fenced in yard. Screened in porch for a rainy day to still enjoy the outside air. 4 Bedrooms, 2.5 baths, Sleeps 10 confortably, Livingroom , Dining Room, Lg Eat-in Kitchen, 2 porches,The Beach is 800' from your door. Convient to all the Cape has to offer. Only 10 minutes from Ferries to Nantucket or Martha's Vineyard, 1 hour to Boston, 45 min to Provencetown. 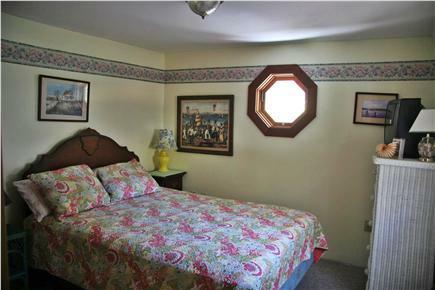 Walking distance to many Resturants, shops, Mini-golf, Etc. Additional availability info: Friday to Friday rental to avoid that Saturday Cape Traffic!. This is a Friday to Friday vacation rental. 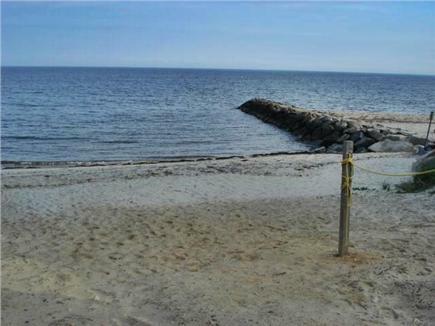 Additional pricing info: 1st two week of July open come on down and enjoy the 4th on Cape Cod!! 10% discount on 2 week rental, State and local taxes of 12.45% will apply. Thank you so much, Jackie. 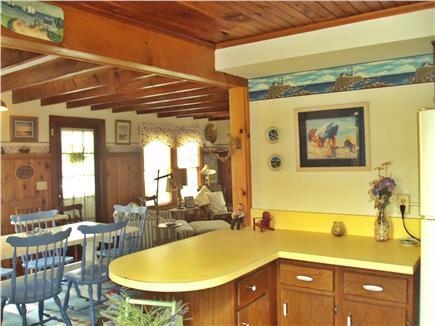 Folks like you are why we have enjoyed rented our cottage known fondly as "time in a bottle." We enjoy meeting and sharing our little piece of Cape Cod with strangers who become friends!! We have rented this house for a week the last 9 out of 10 summers, and we have had a terrific vacation each time. 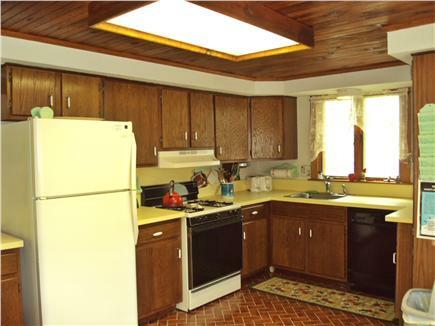 The house and property have plenty of room and you cannot beat the location. We will be in touch with Penny and Bob for another stay this summer. This property was absolutely perfect for our group of couples/friends wanting to get away for a week. 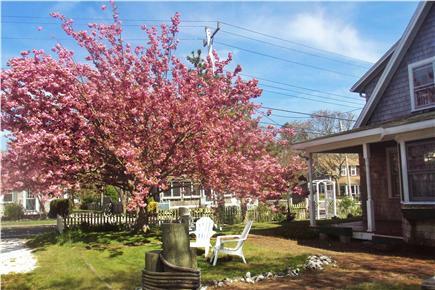 There's so much room, the owners are incredibly nice, and the location was perfect. We enjoyed it so much that it's being rented again for our fall wedding for our friends this year. We would definitely stay here again in a heartbeat! Hello, We would like to tell you that we had a nice stay. Everthing was clean and cozy, and the location provided for plenty of bicycling routes. 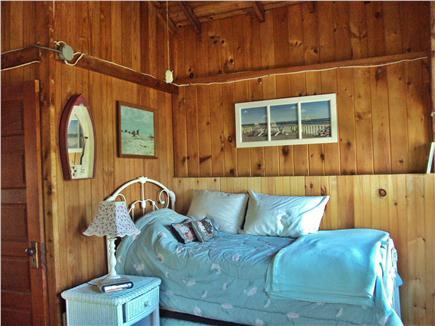 Bob and I have been renting cottages here on Cape Cod since 1975. We moved from Connecticut, where we had grown up and raised our 3 sons to settle here in West Dennis full time in 1998. Most of our tenants have been renting with us for many years and we have formed lasting friendships with so many! We have always enjoyed the Cape and love to share its many hidden treasures with you. Our Beach House is very special to us. When our boys were teenagers we spent our summers here ourselves as they enjoyed their first jobs as life guards, teaching sailing, and working fishing boats. We even had one sons Rehearsal dinner and after wedding at the cottage. So you can understand it is very dear to us. . It is close to everything. so many places you can walk from beach , to gift shops and restaurants. 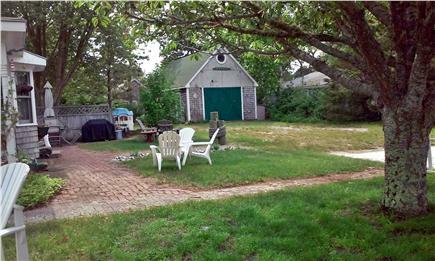 The yard is large and allows lots of room for family games of volleyball, croquet, etc. We consider our Beach House our home and you our guests and we can't wait to welcome you !!! Ebb Tide, or Ocean House, to Pizza, Bakery, Ice Cream at the Sundae school ! great family neighbor hood.